Found 40 entries in 0.112 seconds. But who’s looking at these constellations? So it is from a specific perspective, that Isaac will someday reveal. He drew this at my request; this is from a frame of reference. But we haven’t told you what it is. The best guess is that it’s Silverlight. I haven’t confirmed it, but it is the best guess. The second best guess is Yolen. There are a couple things that people have guessed, but I haven’t confirmed which it is. Footnote: The perspective is now known not to be Silverlight. The painting itself resides in Silverlight, but the perspective is from elsewhere. If the spren turn into any weapon how come all the dead spren are shardblades? It is a Read And Find Out. Footnote: Brandon has previously answered this. It has to do with the fact that the spren modeled themselves after the honorblades, which take the form of swords, so a sword is their default form. What's up with those fish in the Purelake? Haven't you always wanted magic fish? Footnote: Brandon has since confirmed that the "magic fish" of the Purelake do form symbiotic bonds with spren. Footnote: This contradicts other exchanges where Brandon states that burned metals return to the planet. Is Roshar, or has Roshar always been the only large landmass on the planet? Roshar is.... *Brandon then paused and looked up, thinking very hard* Roshar has always been the largest landmass--as long as there has been land. Footnote: Brandon has said elsewhere that the continent of Roshar was created artificially. Was Hoid a Feruchemist before he ever got to Scadrial? I remember reading this somewhere but I can't find it. Not sure if it is a theory or a WoB. I don't believe I ever said anything like that. Footnote: Brandon has said that Hoid uses Feruchemy to know where he needs to go in the cosmere. He has also said that it may not necessarily be Feruchemy, but something similiar based on the same underlying mechanics. One question I did ask Brandon, though, was whether Ym was an Edgedancer. We both acknowledged that with the healing thing, he had to be either an Edgedancer or a Truthwatcher, of course. He pointed out that Ym's spren doesn't look at all like Wyndle. Which I countered by saying that I thought the Ym's spren manifested the way Wyndle would if you couldn't see the Cognitive Realm. He just smiled... and said something like, "I'm going to RAFO that. You're very wise, and I put the description in for a reason, but I'm going to RAFO for now." Footnote: Brandon has since said that Ym is in fact a Truthwatcher and that Wyndle does not look significantly different to Lift than another cultivationspren would to their bondmate. What are ReLuur's spikes made of? Marasi thought they were pewter, but that doesn't make sense. Footnote: Brandon was also asked about this at the Calamity release party where he said: "That you will eventually find out." Still work to do on that... Maybe before the end of the year. Ah, for the book with all the starcharts [Arcanum Unbounded]? Looking forward to seeing it then :). Footnote: A follow-up to this exchange. The "God Surges" you mentioned recently, are they a part of the Way of Kings frontsheet? 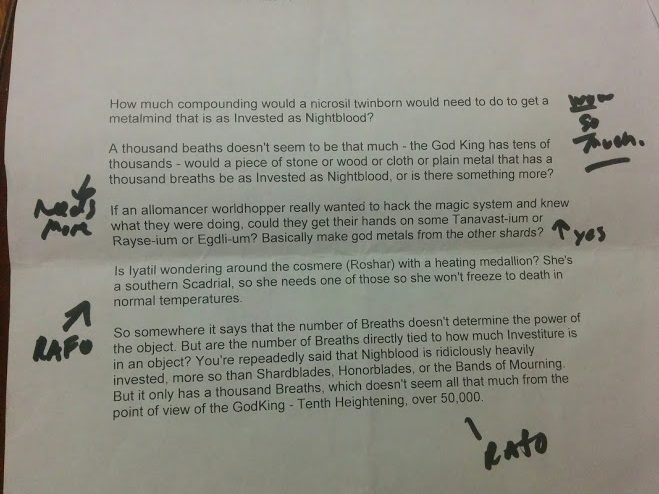 All I said regarding this was to tell a fan that it was possible to make an analogy between the god metals on Scadrial and certain powers on Roshar. However, these are not a codified part of the magic system. Footnote: Argent is referring to an exchange from When Worlds Collide earlier in the month. Does Hoid use his Feruchemical abilities with the atium to see the future? Ah ah ah, I haven't confirmed that Hoid had Feruchemical abilities. *grinning slyly* No, but most people think he has Allomancy. Why in the world would the Lord Ruler spike himself? ...Because he needed to give himself the powers that he didn't have. He could have done it like-- gained the knowledge but the power was gone so fast he actually needed to-- Well no no no, the spikes, the spikes, the spikes. So, it doesn't matter if he was spiked because he was hiding the metals inside himself so people couldn't Push or Pull on them. That's the real reason he was doing that. Does that make sense? Ruin influenced him, what did the spiking do? I think I recall him having the bands with spikes in them? Footnote: Brandon has previously stated that the Lord Ruler did in fact have Hemalurgic spikes. From the early days of the Mistborn books, I'd been planning how an Allomantic gunfight would go down. I felt it the next evolution in what has been stylistically a big part of these books. So, as I said, I walk a line. Sometimes, there are things I just can't do because they violate what I've set up as the rules of the world. Other times, I design the setting and nature of the fight specifically to allow for certain types of cinematic sequences. One thing I like a lot about Wax’s abilities is the power he has to manipulate his weight. There's some realism to what he does—for example, increasing his weight doesn't make him fall more quickly, but it allows him to do some powerful things while falling. Destroying the chandeliers is an example. At the same time, I acknowledge that the weight manipulation aspect of Feruchemy is one of its more baffling powers, scientifically. Is he changing his mass? If so, he should become more dense, which I don't actually make the case when it plays out in fights. (Otherwise, increasing his weight enough would make him impervious to bullets.) So, if it's not mass manipulation, is it gravity manipulation, like Szeth and Kaladin do? Well, again, not really—as when his weight increases, his strength and ability to uphold that weight increase as well. Beyond that, Wax can't make himself so light that he has no weight at all. Footnote: Brandon has stated that iron Feruchemy works by manipulating the Higgs field. What would happen if you tried to cut aluminum with a shardblade? A shardblade would not cut aluminum. Footnote: This contradicts a previous WoB where Brandon said shardblades could cut aluminum. This contradiction is addressed here. Last time you said that his name, if it wasn’t Harmony, it would be something else. Is it Discord? Footnote: The questioner is referring to this exchange.